Improve plant safety and efficiency with safety rails by reducing the costs associated with employee injury, machinery down time, insurance claims, and building repairs due to accidental collisions. Rails install in minutes with ordinary hand tools and concrete drill. 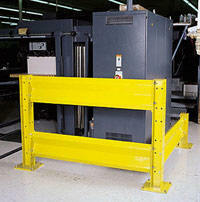 Safety rail systems protect personnel, machinery, building structures, in-plant offices, aisle ways, electrical panels, tool cribs, conveyors, finished products, receiving docks, cooling equipment, and parking areas.